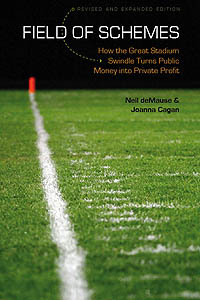 This entry was posted in Cincinnati Bengals, Columbus Crew, Indianapolis Colts, Milwaukee Brewers, Ottawa Senators, recommended reading, Toronto Maple Leafs by Neil deMause. Bookmark the permalink. I’ve been an avid follower of your work for many years. Would you accept a donation in the form of Dr. Grant Long’s book? If so, where may I have it sent? Thanks for the generous offer — I have a request in for a review copy, so let’s see how that goes. I’ve been waiting for this to come out too, Neil. I checked on Amazon a few months ago and they had it listed significantly above $125 per copy, which discouraged me. I understand it’s a low volume seller, but I was prepared to pay about half of what they were asking… Personally, I think Paris Hilton biographies should be taxed heavily to subsidize the sale of interesting and important work like Grant-Long’s. Stadium advocates should be in favour of that, obviously. Wow this would be a great read!! living in the bay area the giants ball park has always been touted as a privately financed ballpark. All local media coverage of this ball park is always how “it was privately financed no public money used”. Maybe when it was proposed these public cost were disclosed (not living in bay area), but now all reports are “its all private money”. Glad your post and Newballpark.org (http://newballpark.org/2012/11/06/chronicle-compares-giants-port-deal-with-warriors-deal/) post comparing the giants ball park to the proposed warriors arena, is bringing these cost out!